Bo and I made a trip up to the White River last week and we drove up Highway 21 through the Boxley Valley and low and behold we got an opportunity to see several Arkansas Elk. Although several hundred yards away Bo was able to get a long distance picture with a telephoto lens on his Cannon Rebel SLR camera. These animals were reintroduced to the state by the Arkansas Game and Fish Commission several years ago and the herd has continued to grow along the Buffalo River. 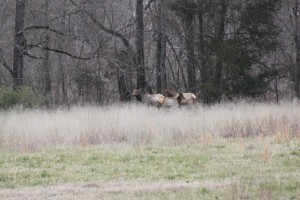 Not many people in Arkansas have actually seen these Elk although their numbers have been sufficient to actually allow limited hunting by permit. By the way, the Caddis hatch is just starting on the White River so get up here! Life is Good on the Fly!